Misty & Dreamy morning on the island of Con Dao, Vietnam. And after Part 1 and Part 2 we have now reached Part 3, the final part of my Tribute to Vietnamese food! The hotpot in the header image was served in a budget restaurant in Da Lat. The pot was placed at the centre of the table and kept simmering while the ingredients were cooking. Not being familiar with the cooking technique, I kept staring at the pot wondering when it would be ready and safe to eat. I must say, it tasted very good. The rolls and dumplings above are from Hoi An, a town whose reputation as the ultimate gourmet getaway is steadily growing. Great food and lovely composition on the plate for this dish! Cao lau is one of the most popular Hoi An specialties, and its ingredients are noodles, slabs of pork, bean sprouts and fresh vegetables. 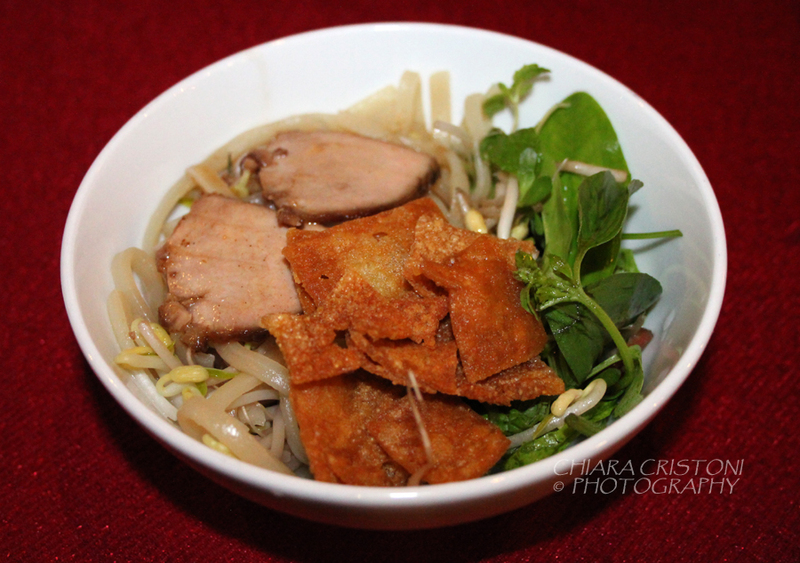 The noodles are quite different from any other Vietnamese dish: thicker, quite chewy and with a firmer texture. The dish tastes delicious! 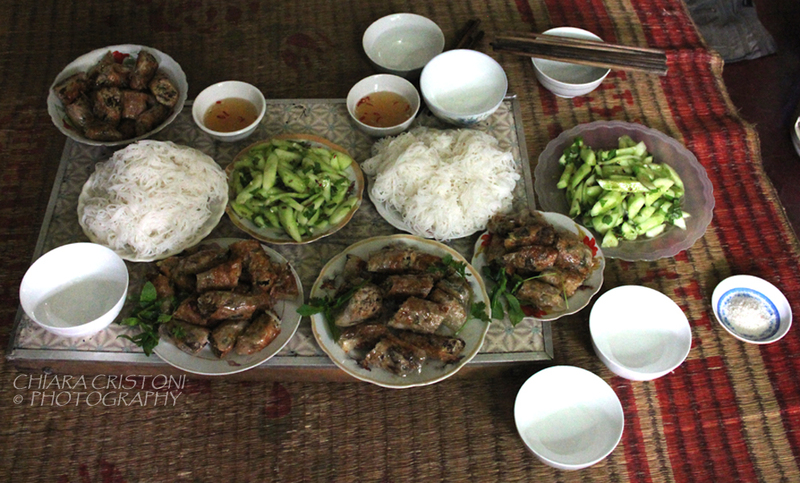 Last but not least, here’s the highlight of my food experiences in Vietnam: a fully homemade meal which I helped preparing when in Hanoi! Noodles, vegetables, and rice paper rolls. Very tasty. See also this post for the full experience. And this is the end (for now) of my Vietnamese food memoirs. 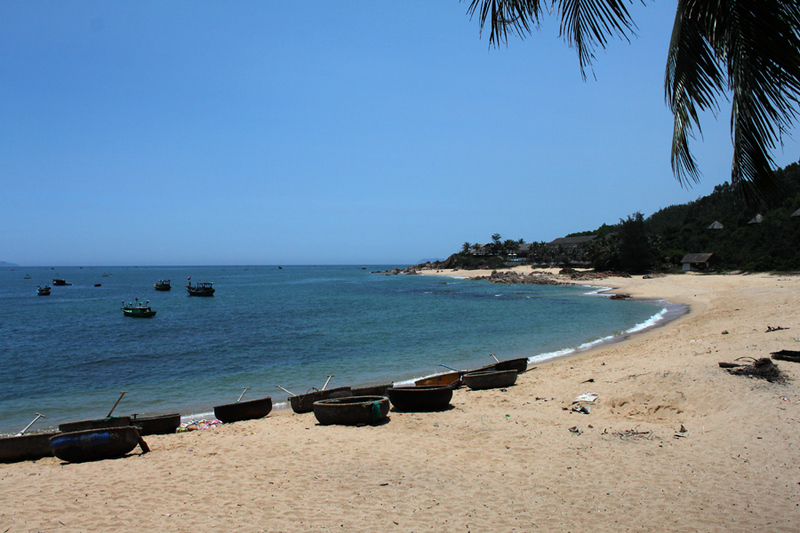 Vietnam is a country of waters: hundreds of miles of coastline, rivers, and huge delta areas characterise its length. 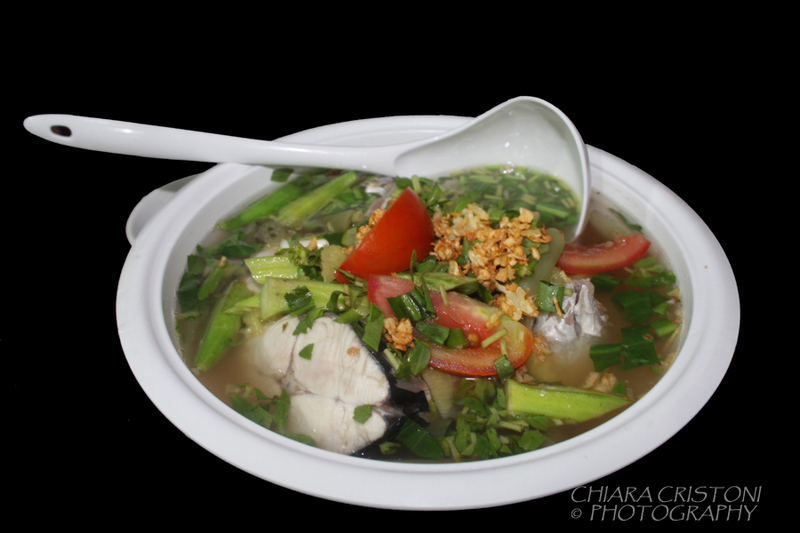 Fresh fish and seafood are readily available, and therefore such dishes abound in the Vietnamese cuisine. 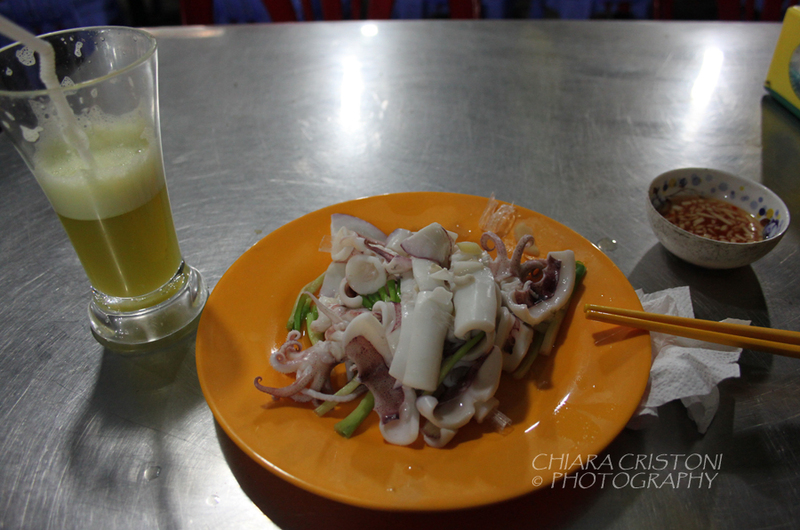 The one above was my first meal at the night market in Phu Quoc, a great place to be. The squid looked fresh and tasted great. The sugarcane juice went very well with it too. The fact that my stomach was not upset at all after the meal (I am sadly prone to food poisoning when in the tropics) made me return to the same market a few times during my stay. 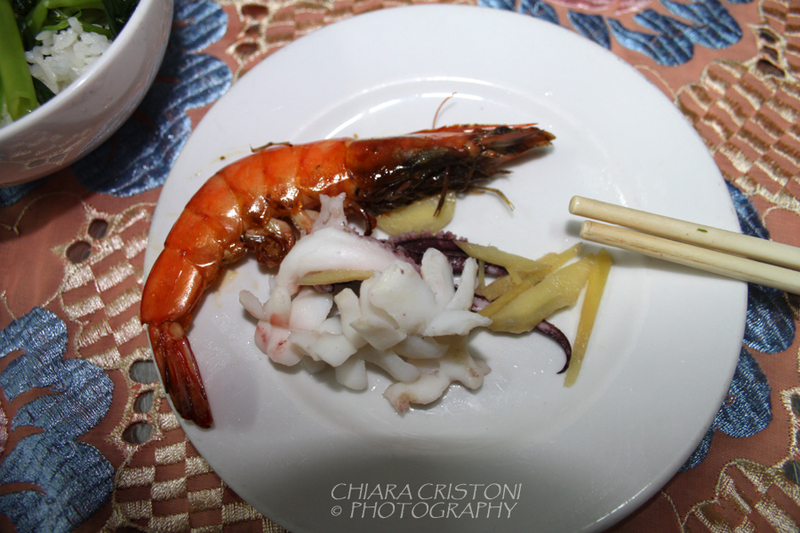 And more seafood dishes were tried. This shrimp and squid combo was actually made of two separate dishes but when put on the same plate they fit very nicely together. Again, all seafood looked and tasted very fresh. As you would expect on an island like Con Dao. The mackerel soup above was prepared using a mackerel that had been caught under my eyes in Con Dao and then immediately taken to the restaurant kitchen. It couldn’t have been any fresher! The mackerel was cooked in three different ways, and the soup version is the only one I took a photo of. Very colourful and yummie! One more from Con Dao: fish in garlic sauce. A bit too much garlic maybe, but it supposedly helps keeping the mosquitoes away. Regardless of any mozzie repellent properties the dish tasted good, the presentation on the plate was very nice and it was incredibly cheap (I don’t remember ever paying more than 180,000 dong for a seafood dish, which is equivalent to less than £5!). 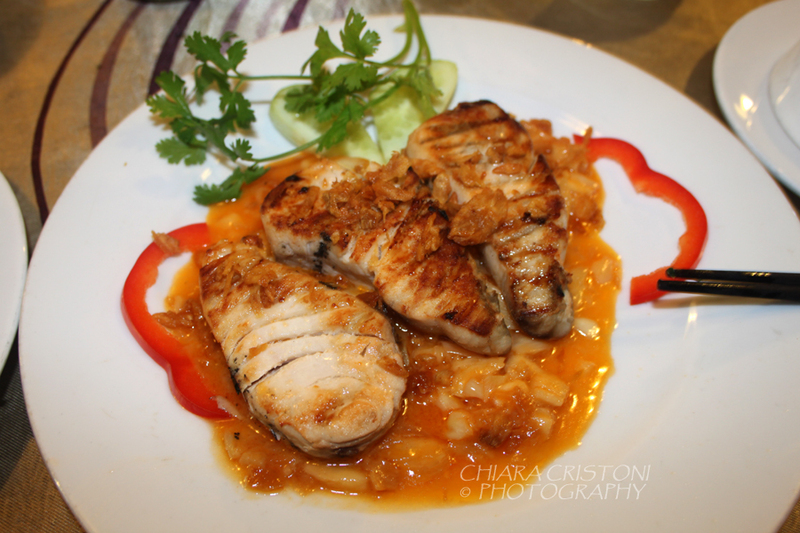 Last but not least in my seafood tribute is nuoc mam, the notorious Vietnamese fish sauce! 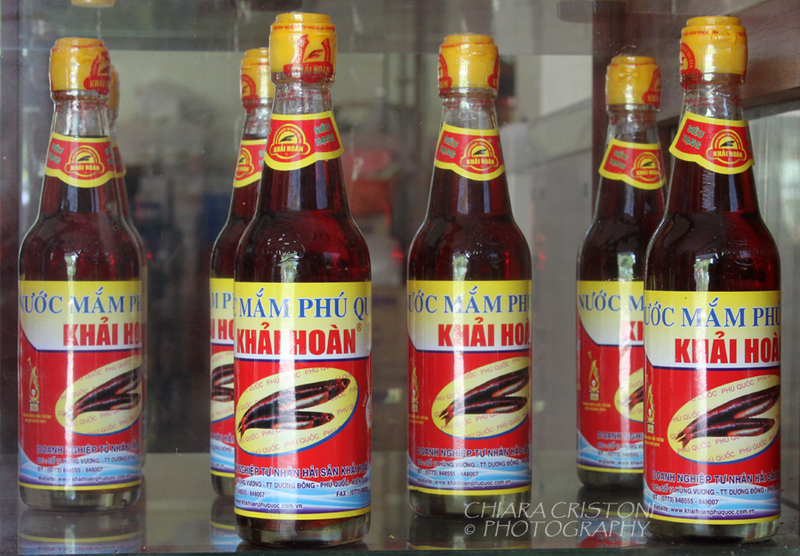 Largely produced from fermented fish in smelly factories in Phu Quoc, the fish sauce is an ever-present ingredient in the Vietnamese cuisine. 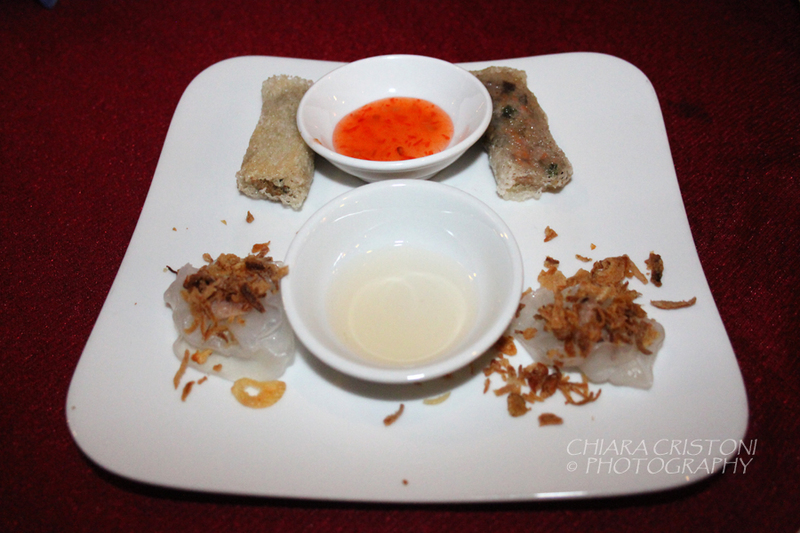 More images and comments about Vietnamese dishes are still to come. Keep following me! A supertiny lizard caught between a man’s fingers. 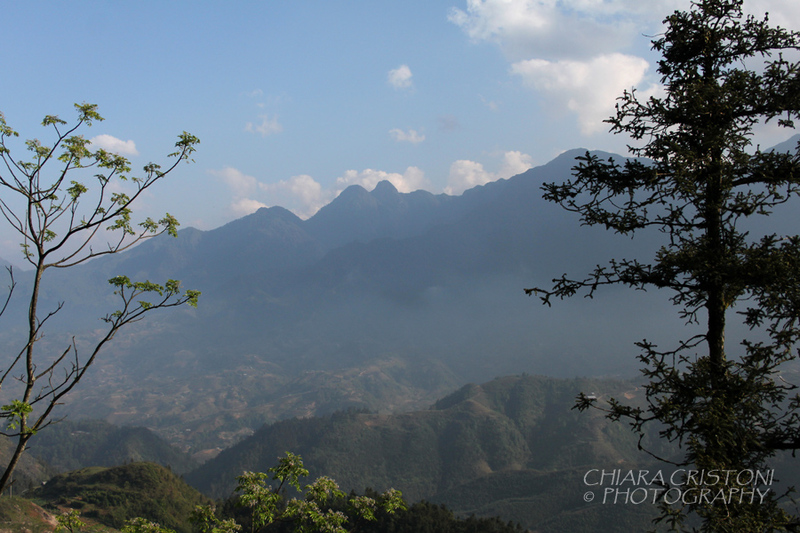 Photo taken in Vietnam during an environmental education evening trek. I am not exactly a cooking enthusiast or a foodie. And I never thought I would ever write about food. But I love Vietnamese food so I thought I’d pay a small pictorial – but not only – tribute to some of the dishes that I tasted during my two trips to Vietnam. Disclaimer: this is not meant to be an extensive review of Vietnamese cuisine, but only a sample of what I tried (and took a photo of). This was my very first meal in Vietnam. On my first trip. 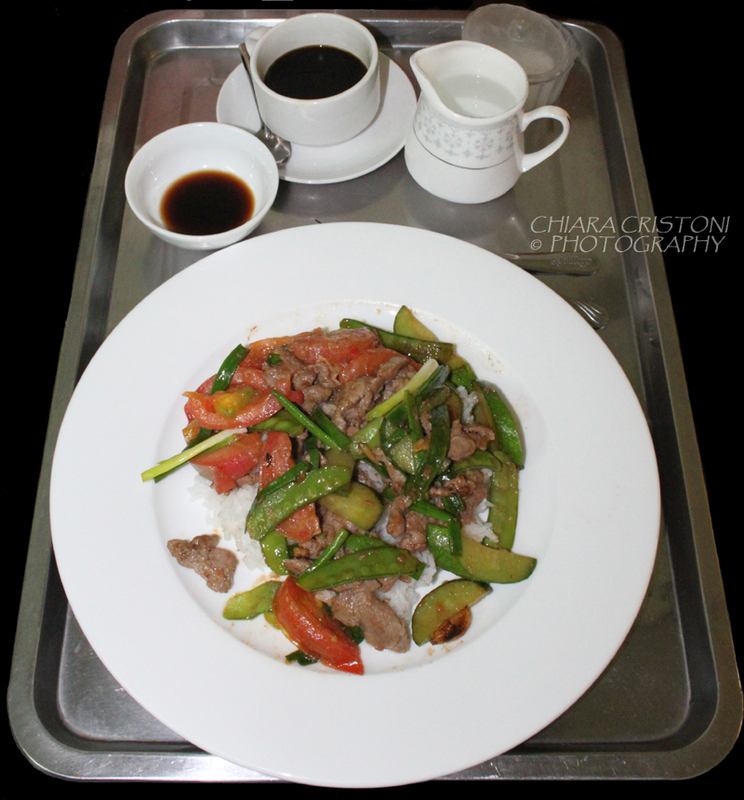 Stir-fry with beef and rice. And a cup of coffee. 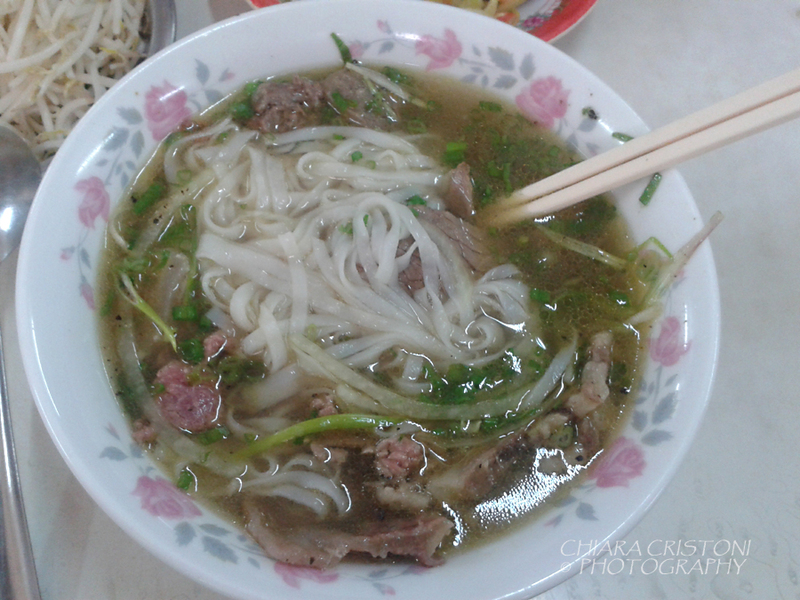 I must admit I love Pho (not for breakfast, though! Lunch for me, please). Simple but tasty and filling. And cheap – which is always a plus. I love the little street kitchens that serve Pho, with their simple tables and chairs. I love sitting with the locals and watching them as they talk to each other and enjoy their meals. There is such a lively atmosphere there :-). 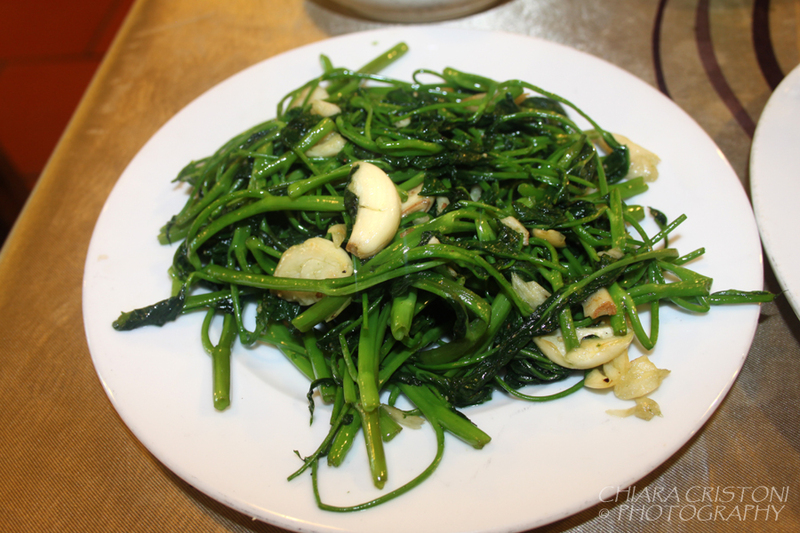 Talking about popular dishes, let’s not forget what is probably the most popular vegetable dish in Vietnam: morning glory with garlic! 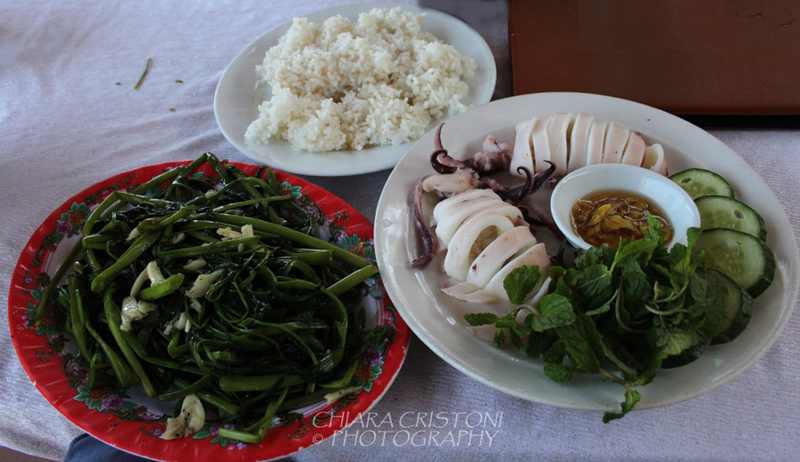 Morning glory, also called water spinach, is probably the most common vegie in Vietnam. As a result, it never fails to show in restaurant menus, usually in the “sautéed” version. When travelling, this became quickly my favourite vegetable dish and I honestly cannot remember going two consecutive days without having my fix of morning glory with garlic! The tribute to Vietnamese food doesn’t end here, so keep following me! 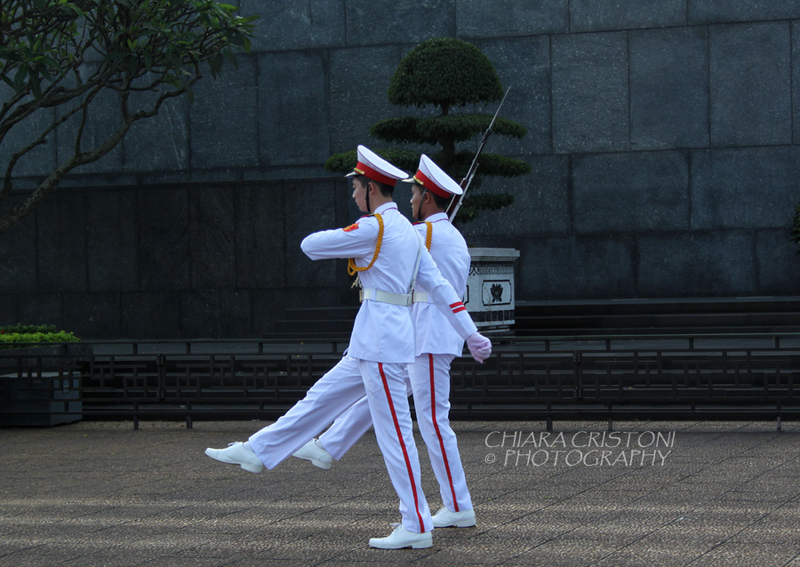 Last but not least, I have now updated the Vietnam Photogallery. 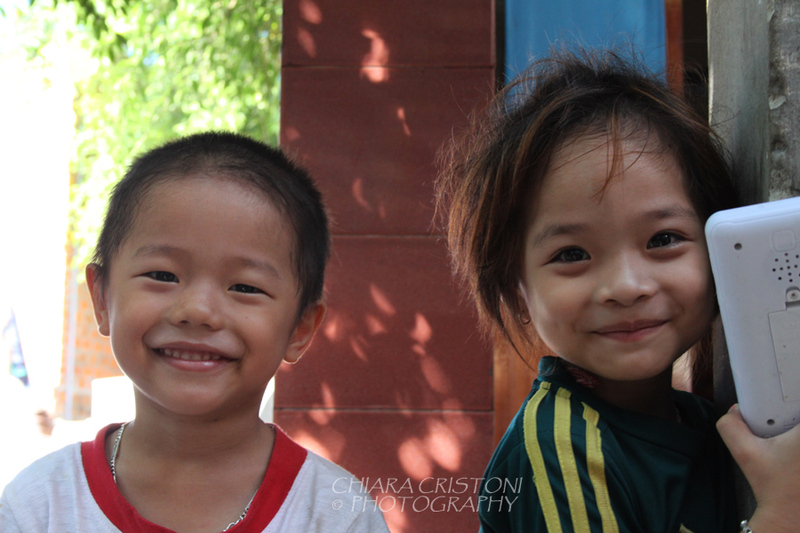 More photos – also from my previous trip to Phu Quoc – and on larger display are now available! Click here to view them :-). This is the story of a random last minute decision – not uncommon when you travel – that took me to an amazing place with amazing people. Right at the end of my trip. I was about to fly back to Vietnam from Lao, and still hadn’t decided where to spend the following week. The last week of my trip. 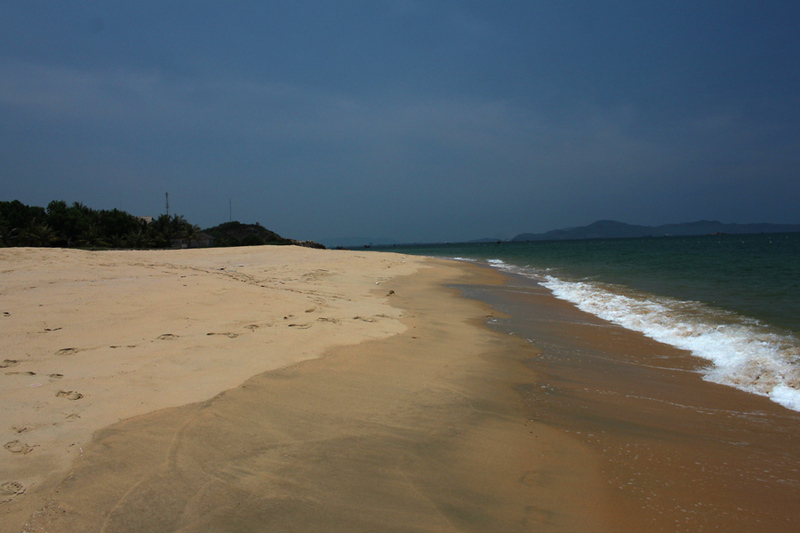 I wanted the sun and the beach, but I already been to Phu Quoc and Con Dao. And Mui Ne and Nha Trang had zero appeal for me. Should I go back to the mountains instead? 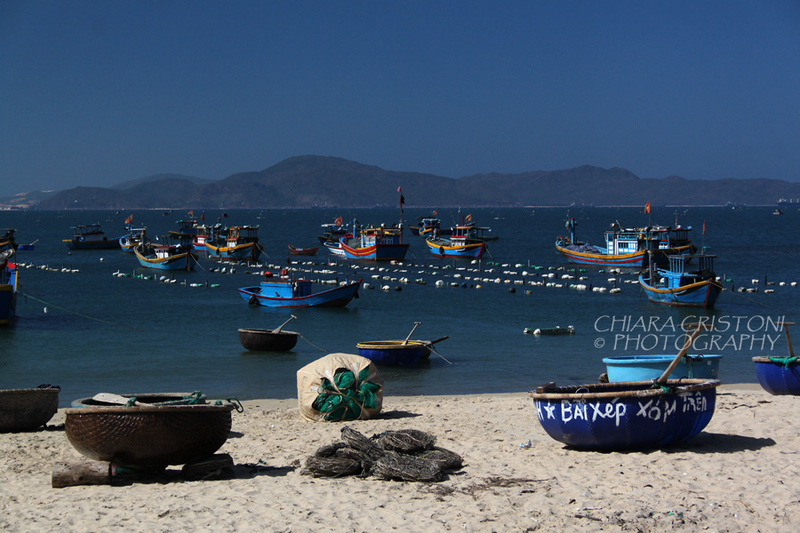 Then I remembered Quy Nhon. A friend had mentioned it to me as a place relatively off the main tourist trail. Worth checking it out! The fact that there are direct flights from Hanoi, and at reasonable prices, played a part in the decision too. I checked on Tripadvisor: there’s a guesthouse by the beach in a fishing village! It’s called Haven. It sounds like my dream place :-). Within 24 hours I had booked flight and accommodation. 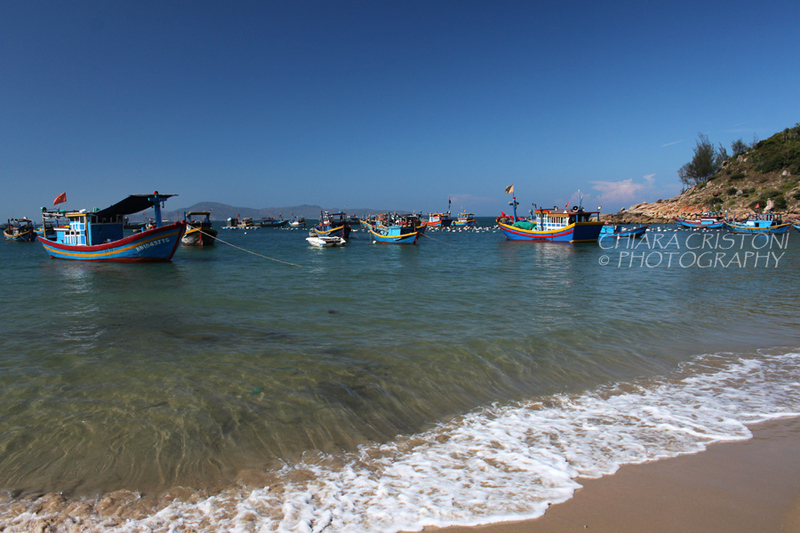 And two days later I arrived at Bai Xep, fishing village 10km from the city of Quy Nhon. Just like in my dreams the beach was outside our front door, and was dotted by fishermen’s round boats. A handful of rocky islands in the sea in front of us. No tourists apart from us in the small guesthouse. I fell in love with it within seconds! My days there were made of walks along completely empty beaches, suntanning (best tan I have had in decades! ), eating delicious food cooked at the guesthouse, watching the locals hanging out at the beach, walking around the village, chatting with the other guests and with the lovely guesthouse management. And how can I forget Kitty, the sweetest kitten ever?! She was very unwell and didn’t move much, and all you wanted to do was cuddling her. What an amazing place! What an amazing time! I had planned to stay 3 days. I extended it to 5. And tried to extend further, but logistic issues prevented me from delaying my departure from Vietnam. 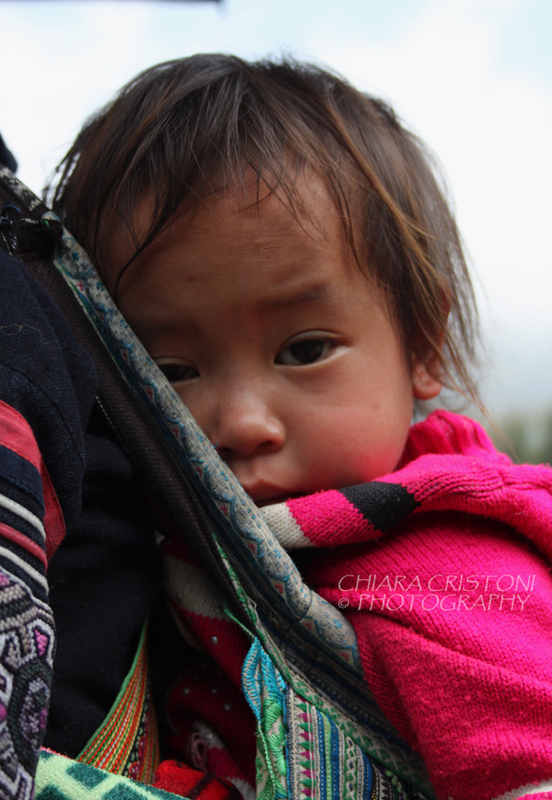 I left one day after lunch – crying like a baby. 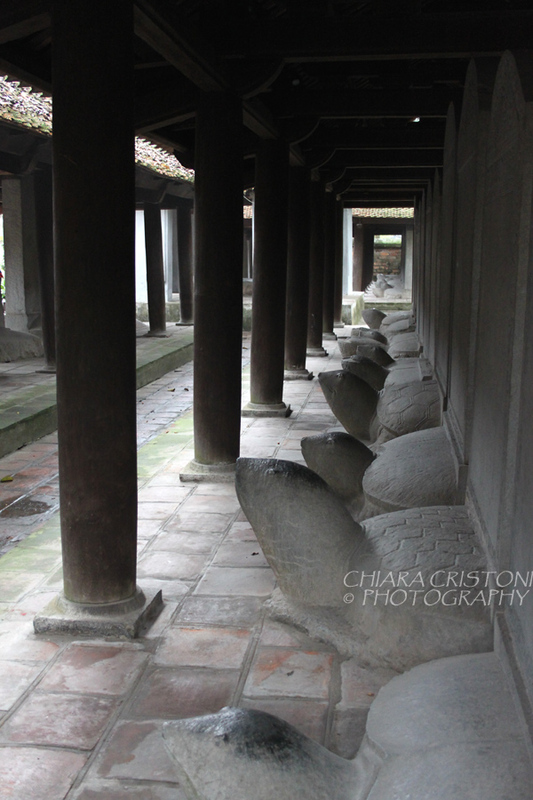 I felt I had been locked out of heaven…. 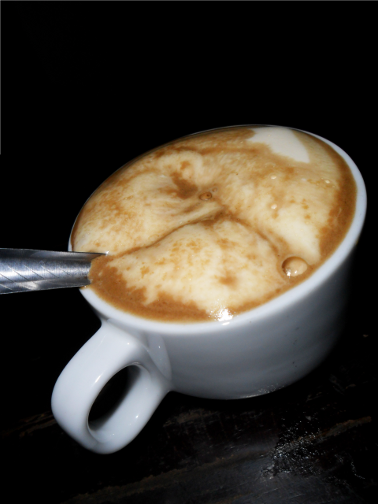 When they invited me to have “egg coffee” with them, I followed them with no hesitation. But when we walked into the back of a shop and up dodgy-looking stairs in very dim light, I started doubting my instinct and my trust in people. There was no need to panic, though. Instead I was about to embark on a journey of discovery off the beaten track! 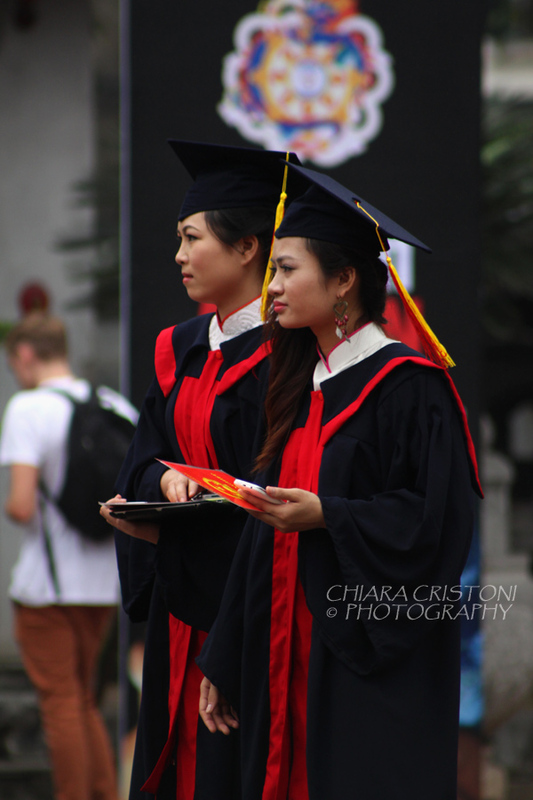 I had met these two students at the Hoan Kiem lake park, where University students in Hanoi go to meet foreigners and practice English. After several weeks in Vietnam I was totally familiar with the scenario and quite enjoyed chatting to whoever approached me. After the egg coffee – which was delicious – we promised to keep in touch. 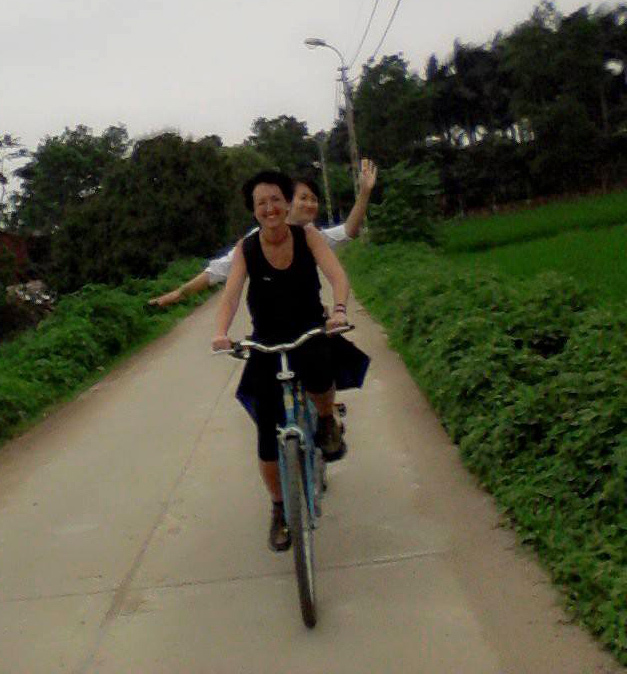 And when I was back in Hanoi 10 days later I contacted them. “Would you like to see our University?”. Why not, I thought. And we got on a local bus full of students for our long ride to the campus. Once we got there, I soon realised that there were no other foreigners around. Everyone seemed to be staring at me with surprise and curiosity. Celebrity of the day! “Now we are taking bicycles and going to my room so we can cook lunch”. Cool! We first stopped to buy some food from a tiny grocery shop in the street, then two more students joined us and the five of us rode our bicycles through the countryside to reach the area where these students live. 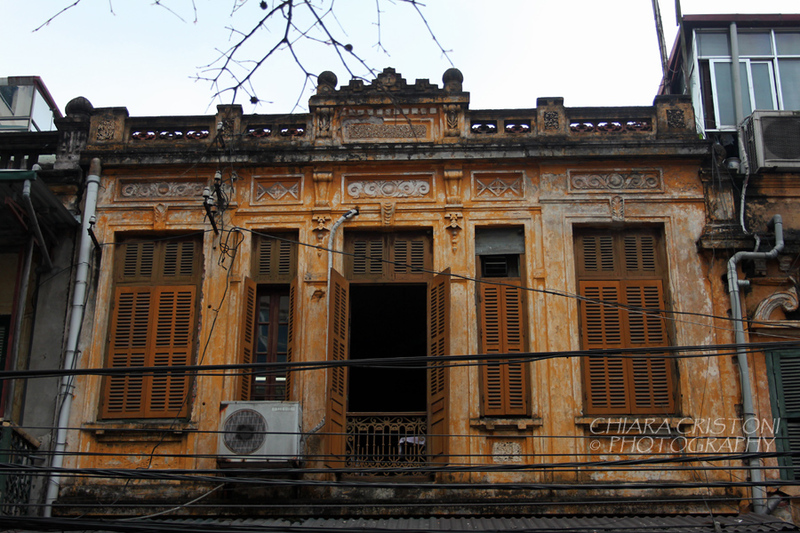 Compared to the standards of students digs in my own city, these Hanoi ones appeared pretty “scruffy” and very basic. But they indeed do the job, and have everything we needed. So we started preparing lunch. After washing and chopping the vegetables, I joined in the “rolling phase” of the nam (rice paper rolls) making. I broke the first one but soon mastered the art :-). Our “masterchef” skillfully pan-fried all rolls while her “assistant” made a nice sauce, and the rest of us prepared the table. The resulting meal was a five-star! “Do you want to see an artisan village?” I was asked after lunch. Why not, I thought. 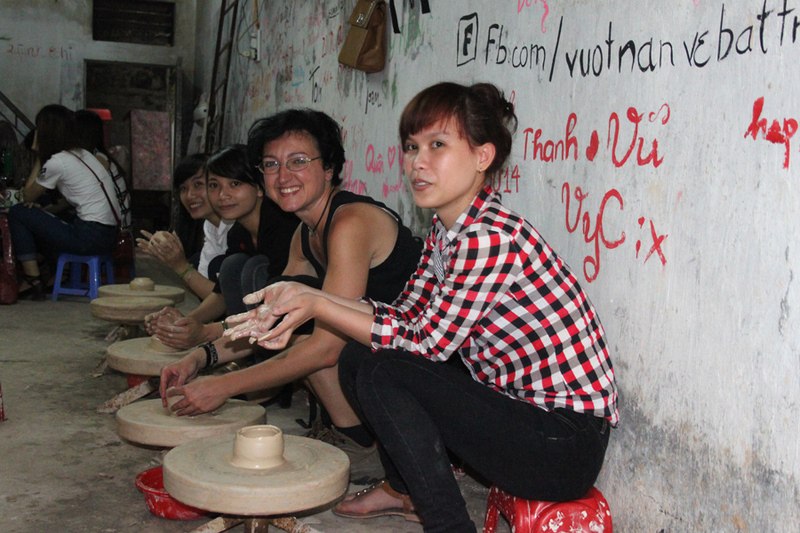 And this time we hopped on motorbikes and drove (me as passenger) to Bat Trang village, which is famous for its ceramic/pottery production. We walked around the shops taking a lot of silly photos, then when I thought we were about to leave another surprise came. 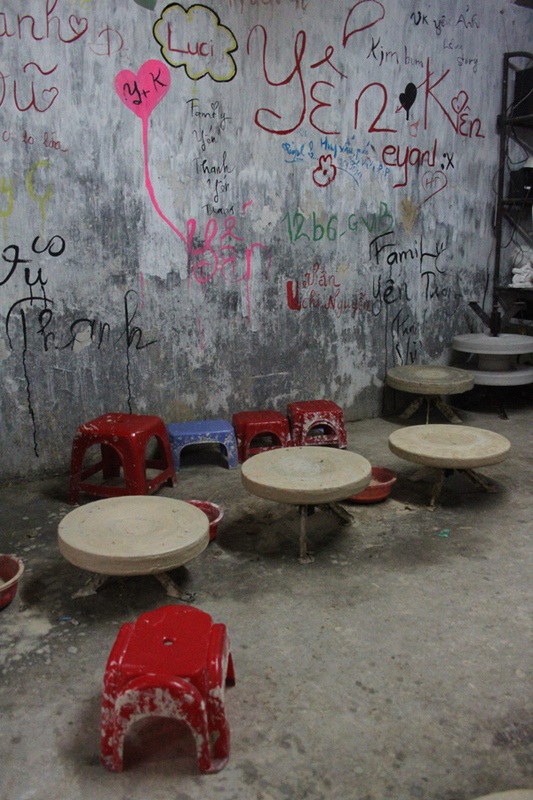 We entered a small shop full of little plastic chairs and wheels with lumps of clay on top. We sat and were shown the basic technique for making a small vase. Then it was our turn! I have to say that none of us appeared a natural pottery maker, but we had lots of fun messing around with the clay. And after a while some of our production didn’t look too bad! 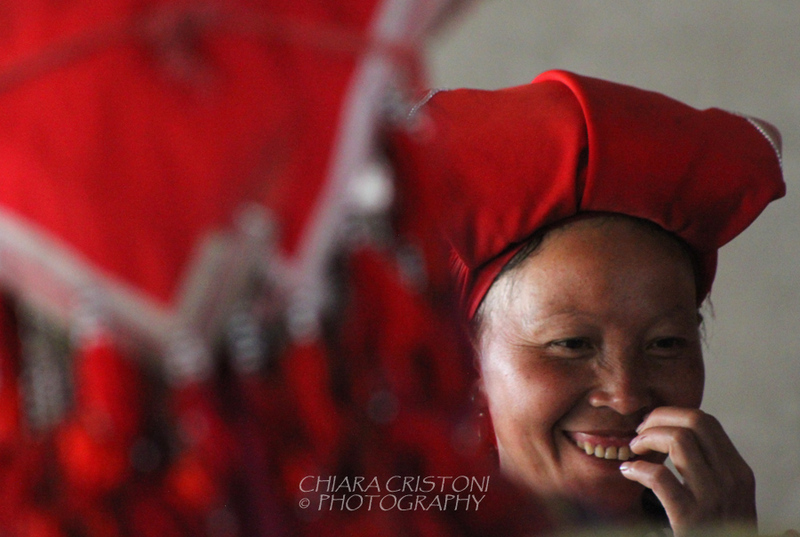 I had so much fun and loved the whole experience that day, and I am sure that other tourists would love it too! 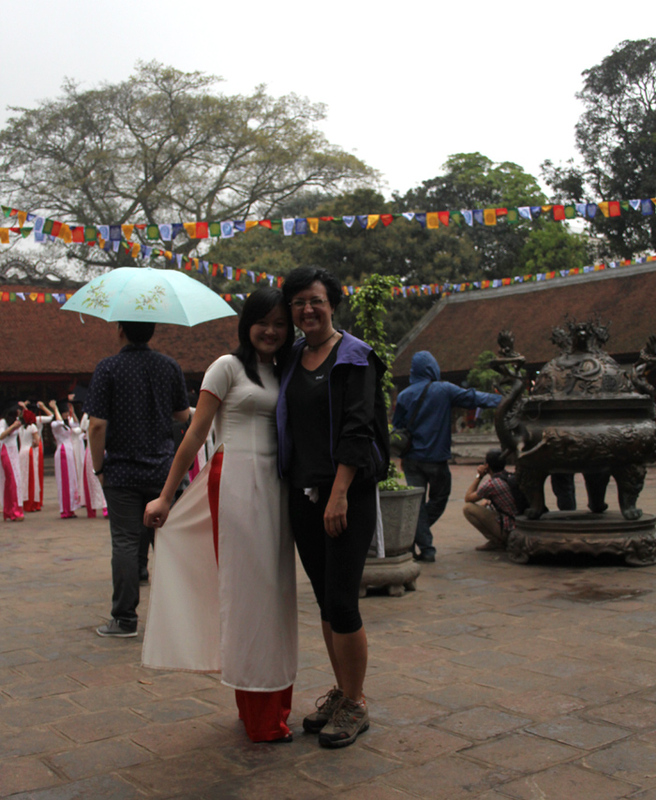 My student friends could even create a “tour package” based on my day with them (guinea pig!) and offer it to others, in exchange for their time and some English practice. I will suggest it :-). And this is some of us! 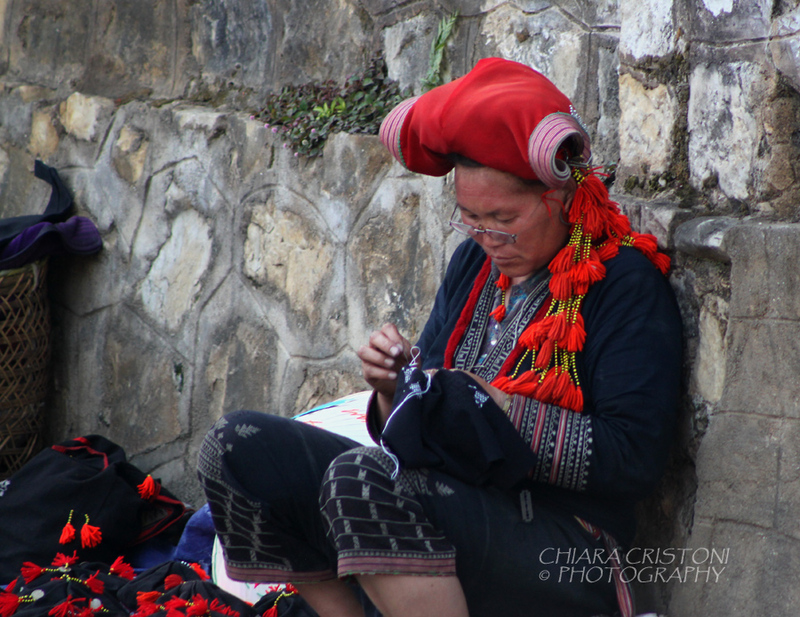 Sa Pa was not in my travel plans. A few friends had recommended it to me, but I wasn’t too interested and I couldn’t fit it into my itinerary anyway. 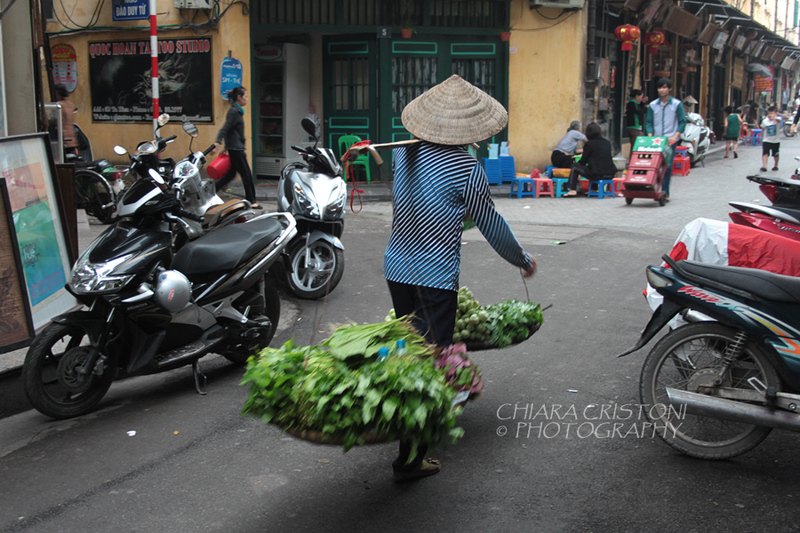 My plans for the north of Vietnam included Ninh Binh, Ha Long Bay and Hanoi. Then Ha Long Bay lost the battle. 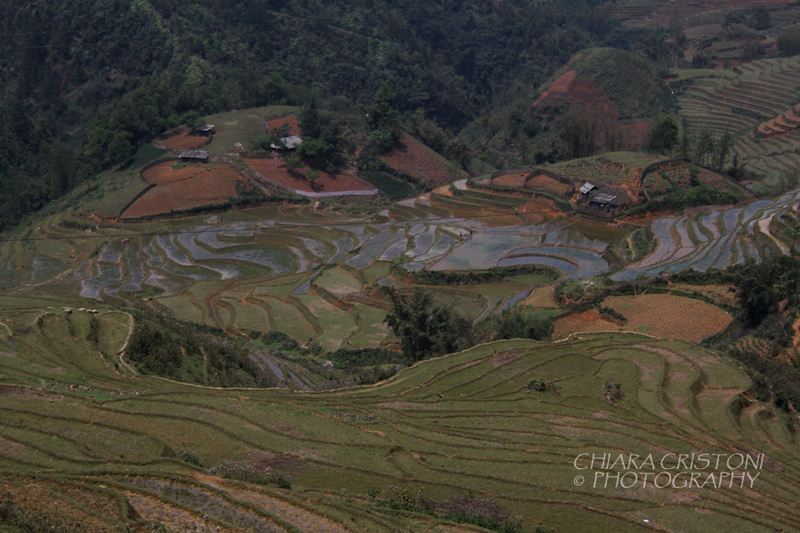 And on my third day in Hanoi I booked a trekking tour to Sa Pa. Departure the following night. 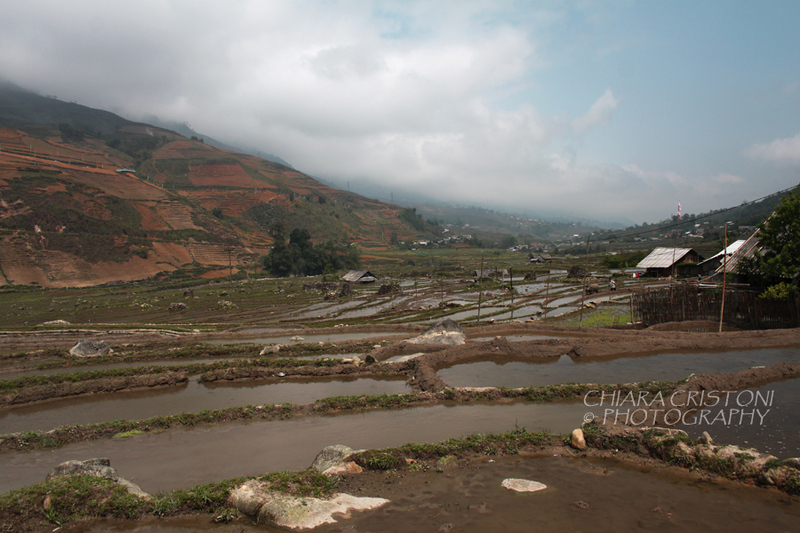 Sa Pa is a mountain town in northern Vietnam, very touristic but also very pretty. A prettier version of Da Lat in my opinion. 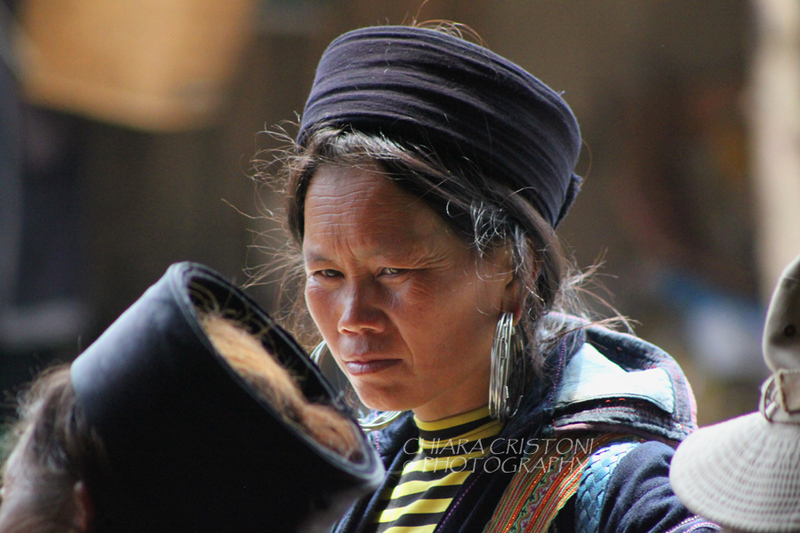 Perched on the edge of a mountain, it is very popular also because the surrounding villages are inhabited by ethnic minorities: the majority of the minority people in Vietnam live in the Sa Pa region. 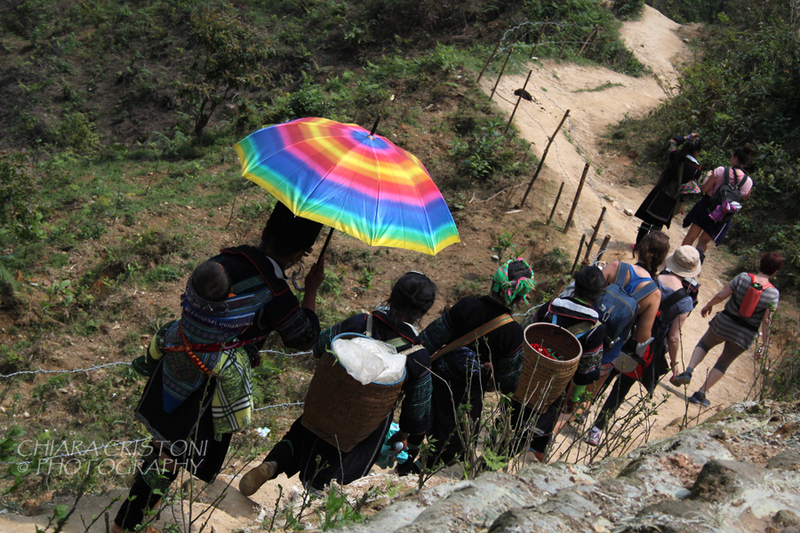 Organised trekking tours bring hundreds of tourists to Sa Pa everyday, arriving in the morning from Hanoi by bus or by train (overnight journeys). My tour was a 2-day/3-night one, with one night in hotel. I chose not to do the homestay for logistic reasons, but it would have been interesting. 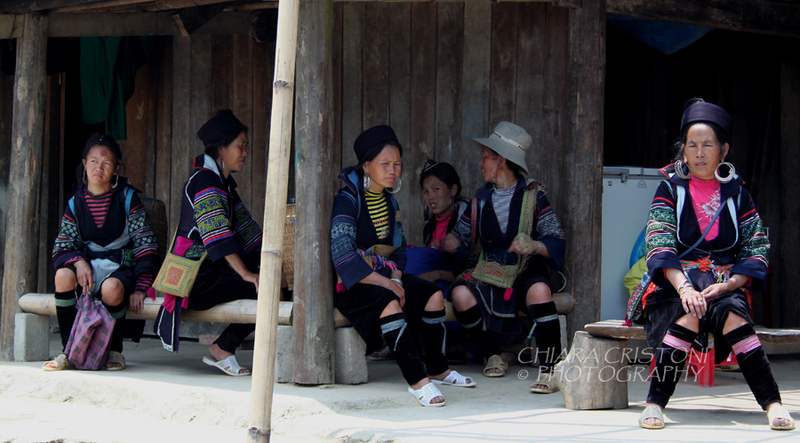 We did two treks: on the first day our Black HMong (one of the minority groups) female guide took us to see two villages, Lao Chai and Ta Van. 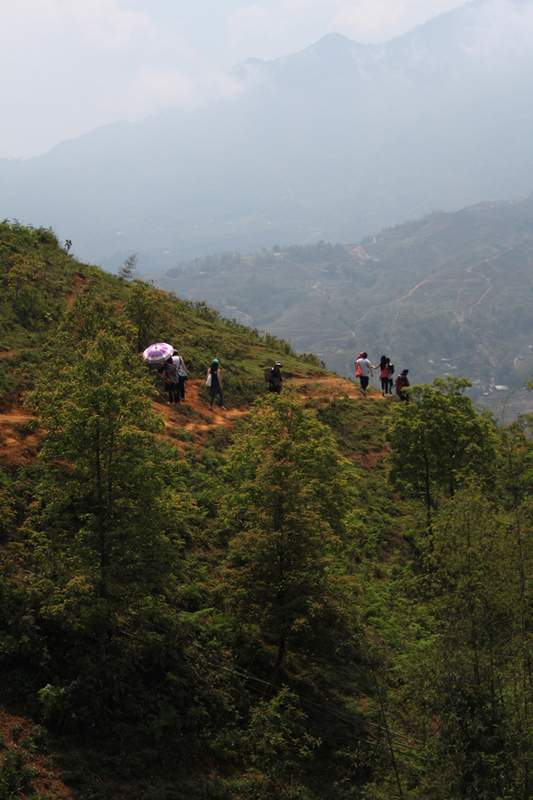 The 12-Km trek was classified as “easy” but it still involved climbing steep paths on the edge of the mountain. In the blazing sun it wasn’t always fun. 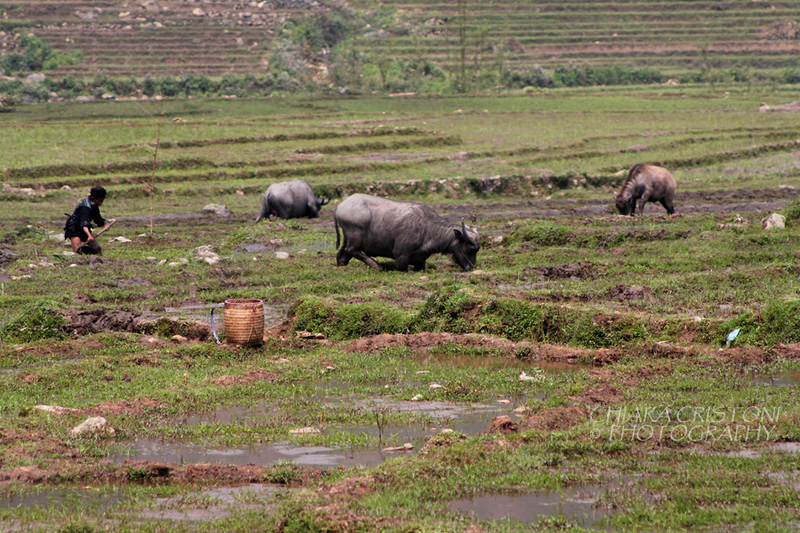 But the views were amazing: terraced rice fields, water buffalos, mountains everywhere. 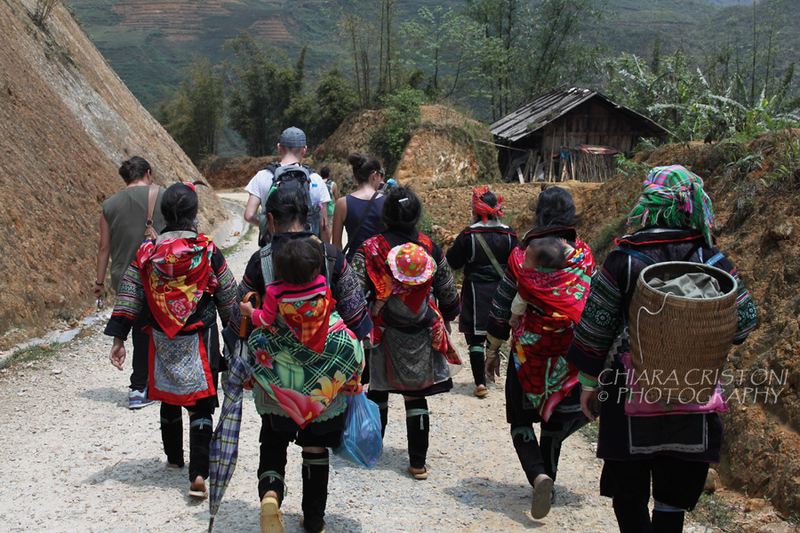 On our second day we went to a village (Cat Cat) just outside Sa Pa, a much shorter trek that took us first to the Cat Cat waterfalls then up and down a mountain to enjoy some more stunning views. 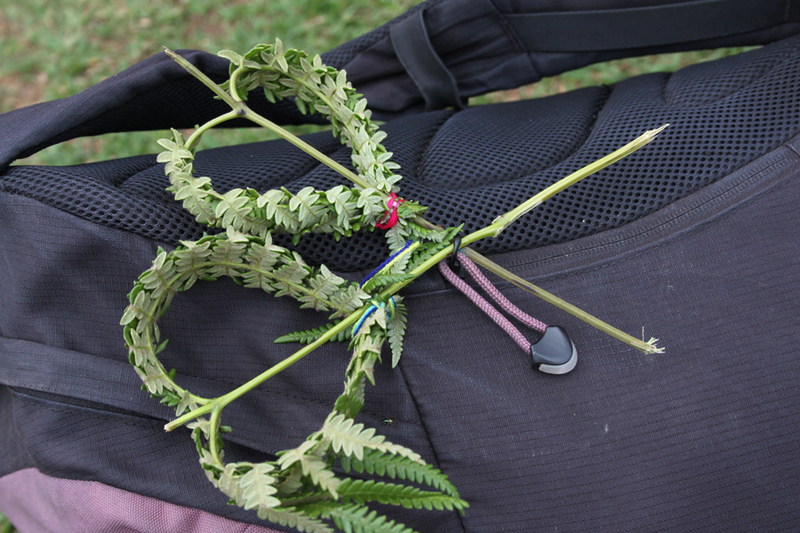 There was also a relaxing moment when we sat with our guide who taught us how to make some ‘souvenirs’ using plants :-). 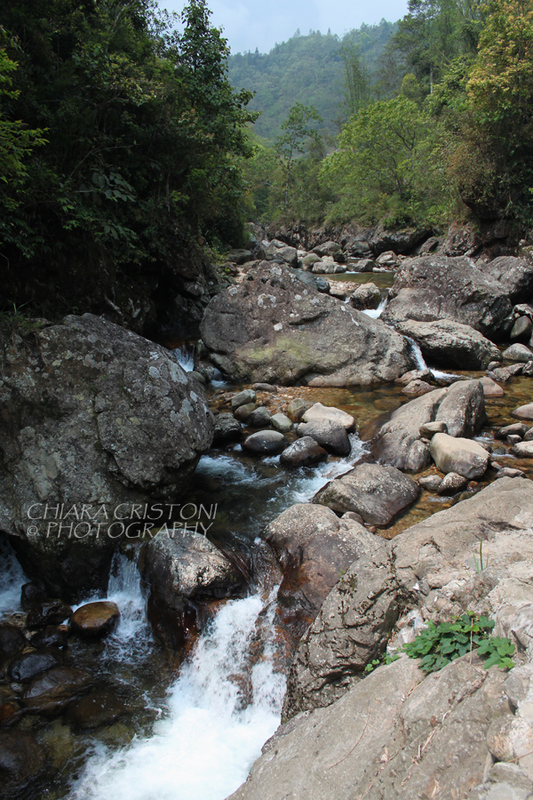 I would love to go back to Sa Pa and do longer treks, and homestay too! 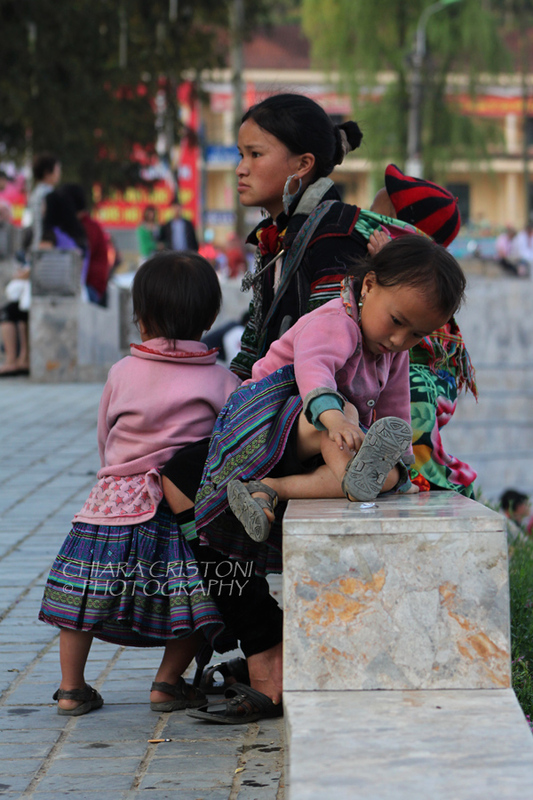 And here are more photos of Sa Pa and its ethnic minorities. 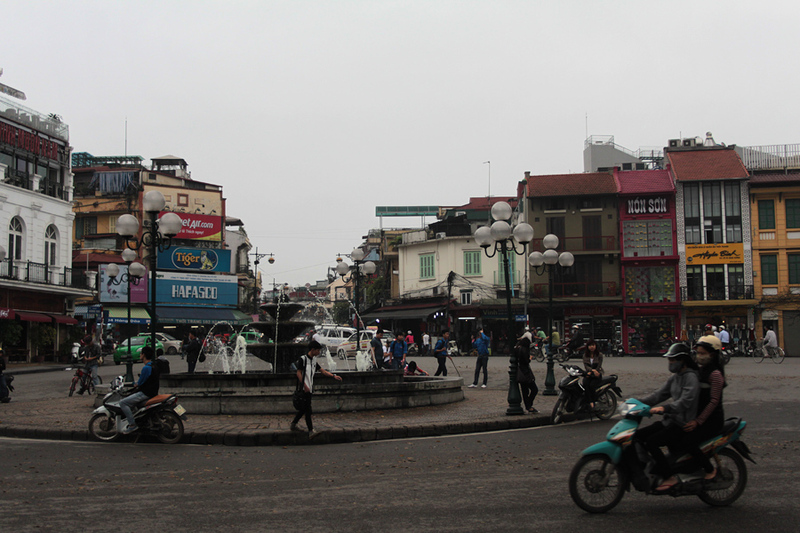 My first impression of Hanoi, the capital city of Vietnam, was not good. Just another crowded and noisy city. Admittedly, after spending two days in the Ninh Binh countryside in the middle of nowhere, anything louder than complete silence was likely to annoy me. My first night in Hanoi. KFC for dinner (argh! ), as I could not be asked looking for a “proper” place to eat. Too many people around (it was Saturday night and the weekend market was on). And I had not studied the city map yet so I had no clear idea of where I was and how to move around. I hated it. But then Hanoi started growing on me. It is actually a very nice city! 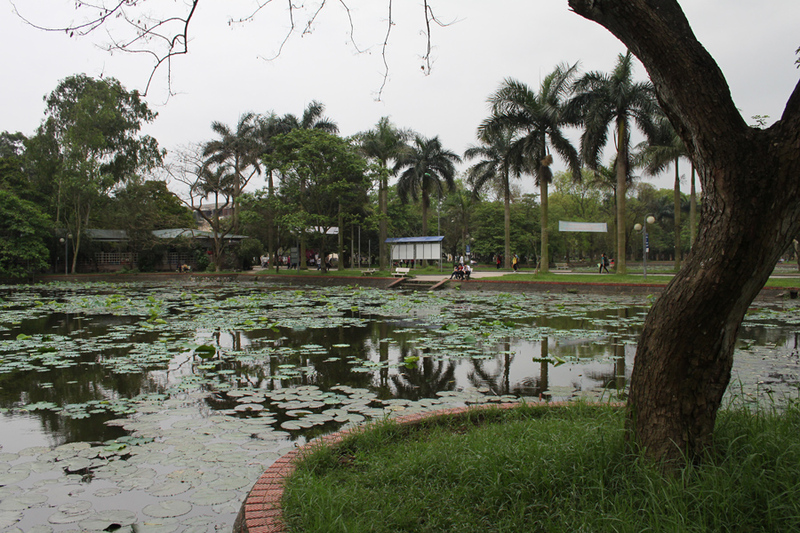 The Hoan Kiem lake in the city centre is a great place to stretch your legs and watch people, at any time of the day. There are always dance classes going on, people jogging, doing push-ups or practising tai-chi! The Old Quarter is a madness of street vendors, little shops displaying their stuff on the pavement, street kitchens, motorbikes and people everywhere. But it’s fun and full of photo opportunities. The buildings themselves are quite interesting too. And then you have the museums! They will keep you busy for a day or two, and they deserve a visit. I skipped the Ho Chi Minh Mausoleum because of the never ending queue, but went into the Ho Chi Minh Museum (a surreal experience…) instead. 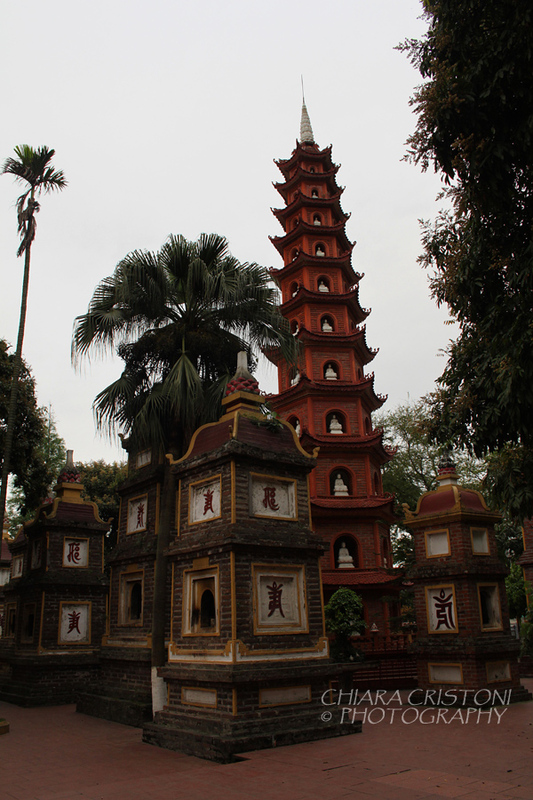 Nearby also the One Pillar Pagoda is a sight not to be missed. 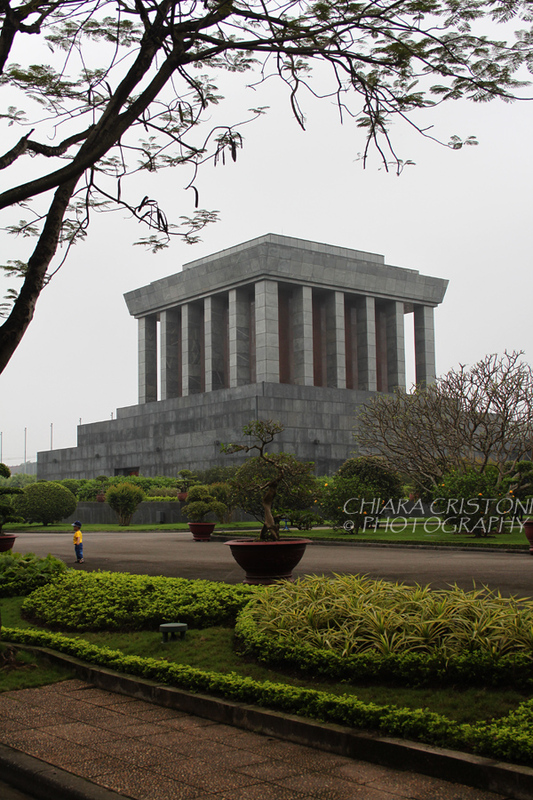 The Vietnam National Museum of History (with two buildings across the road from each other) has interesting displays that reflect the history of the country from prehistory to contemporary times. 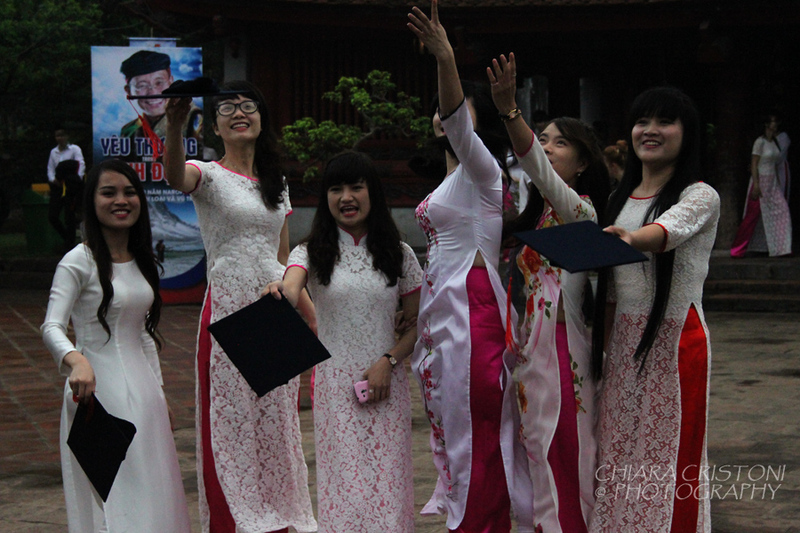 But the highlight of the day was my visit to Van Mieu (the Temple of Literature, Vietnam’s historical centre of learning): a large group of University students was there to take photos in their graduation gowns and in áo dài, and all us tourists joined in the events, either as photographers or photo subjects or both! This student took a photo with me on her iPad too!